What hides in IMPA's new agenda? Marine Trader’s editor Tom Holmes catches up with IMPA’s Secretary General and COO, Stephen Alexander, to find out what’s been dominating IMPA’s agenda over recent months. ‍TOM : Nice to see you, Boss – you’ve not been about much over the past few months. Care to enlighten us to what’s going on?! STEPHEN : Yes, sorry about that but as you know I’ve been engaged in a major new project for IMPA and it’s taking almost every moment of my time these days. It’s exciting times with IMPA heading an industry initiative in the field of CSR. We are working with world-leading consultants to deliver a new service for members and the industry at large. TOM : OK, you’ve lost me already, let’s take this nice and slowly. What’s CSR? STEPHEN : Yes, thanks for that, one of the issues with this is there are lots of jargon words! CSR stands for Corporate Social Responsibility or Corporate Responsibility (CR) as it’s referred to by some businesses. There’s no clear definition of CSR but many exist. A good explanation comes from the author Charles Handy who, when writing in the Harvard Business Review, sets out that the basic question with which CSR concerns itself: what is a business for and what contribution does it make to society (Handy, 2002)? TOM : Wait a minute; this sounds like tree hugging? Is this a new fashionable thing or what? STEPHEN : Not really, CSR has been around for along time and as a field of academic study since at least the fifties. Its prominence has been raised over the last 20 years or so, alongside globalisation and a global media explosion where companies are held to accountfor their actions and attitudes by the watching public. TOM : OK, but what’s the relevance to IMPA and the maritime industry? STEPHEN : Well that’s where it starts to get exciting for us at IMPA, you see for a long time it has been considered that supply chain management has a key role to play in contributing to a responsible business approach, but it’s been a question of how to go about it in a practical way. When I first got involved in this project, Kathrine Geisler from J.Lauritzen, who is on the IMPA ACT working group, explained to me how international institutions like the United Nations (UN) and the Organisation for Economic Cooperation and Development (OECD) have increased their focus on how businesses integrate social and environmental issues in their supplier due diligence. I now realise how significant it was when the UN general assembly unanimously endorsed a set of guiding principles for business based on the UNGlobal Compact. TOM: Wow! A number of issues are brought up here and I want to be clear on this, you mention a working group - and I’ll come back to that - but are you saying this is a UN driven project? STEPHEN: In many ways yes, to give you a bit of important background in 2000 the UN launched the Global Compact which putforward a set of 10 principles that businesses are expected to embrace and support and act on within their own company’s sphere of influence. These principles represent a set of core values in the areas of human rights, labour standards, the environment and anti-corruption. The Global Compact encourages businesses to engage with their suppliers and to advance sustainable development objectives as part of their commitment to working to these principles. Then in 2005 what was the UN Commission on Human Rights, now the Human Rights Council, created a mandate for an individual expert to look anew into the subject of business and human rights. This was a Harvard Professor named John Ruggie. After six pain-staking years of work, his Guiding Principles were unanimously accepted by the Human Rights Council and have subsequently been adopted by states and other bodies and aligned to practices in many corporations around the world. What hasn’t’ quite been done in the field of supply chain management thus far is the creation of the necessary‘tools’ to be able to manage this responsible supply chain management (RSCM) activity in a way that’s sensible and practical and that is exactly what the IMPA programme is setting out to achieve. It’s a great project for our association and our industry. TOM: OK this sounds great but how are youdoing this? STEPHEN: Following some ground breaking research work conducted in Denmark by some IMPA members and other bodies, we have formalised a working group led by IMPA and Global CSR who are world-leading management consultants in this sphere, having been in this domain for almost 20 years. Their inspirational work in interpreting the UN Guiding Principles is being complimented by the other working group members' skills in supply chain management and marketing. All together we are working towards bringing forward an industry initiative to make responsible supply chain management (RSCM) effective and achievable for all types of businesses in the maritime sector. TOM: So what is the working group doing then? STEPHEN: We are working towards the creation of a series of practical and implementable tools that can be put in place for responsible supply chain management that includes a supplier code of conduct, supplier assessments and collaboration tools, as well as a support website full of background resources and materials to support and enable implementation. TOM: Who’s in the working group? STEPHEN: The working group consists of IMPA members J.Lauritzen and D/S Norden, with representatives from purchasing and their CSR departments. This includes Henrik Steffensen (well-known ex-council member and friend of IMPA) of J.L and their CSR corporate responsibility manager Kathrine Geisler who spoke at IMPA London last year, and from D/S Norden, Ole Lykke, senior purchasing manager and from the CSR department, Ulla Nielsen who is CSR director and her colleagues Satnam and Emma. Then you have Sune and Signe, Director and lead advisor from the consultants I mentioned, Global CSR, and from IMPA, you have me, Susan, our CFO, and of course the big boss, Jan, our CEO. TOM: OK it sounds good, but is this a project that will drive cost up for the supplier, meaning they don’t see any direct benefit other than complying with the owner’s demands? STEPHEN: A good question, but actually it’s quite the opposite! Something that the purchasers on the working group wereabsolute in ensuring was that this project should be a process that strengthens and develops relationships with their suppliers and the tools provide the framework to do exactly that. Henrik has seen in the past for example how his team’s auditing processes have created a better mutual understanding withsuppliers and in some ways we are building on that philosophy. A point I would make is that this is not just a management system that the owners implement and the suppliers adopt, but a collaborative tool that facilitates working together, sharing knowledge and experience and shaping the outcomes in a partnership way. In this respect, I believe it to be at the heart of the IMPA philosophy too, with both supplier and buyer achieving a best practice policy along a process they develop together. TOM: I’m with you on this but how will it work in practice? STEPHEN: In practice, shipping companies will sign-up for the programme and gain access to the IMPA toolbox and resources.They will be able to learn about the background of the project and find learning materials and guidance documentation. In time, we will develop case studies and videoclips too, there’ll be links to other key sites and relevant portals as well. Once they sign up, they will link with a number of suppliers that they choose and register that on the IMPA database - then they’re up and running and on the road to responsible supply chain management. The process will follow a road map and action plan along the way and they’ll be able to interact with others doing the same thing via the IMPA website. TOM: What if I already have policies and systems in place? Why would I want to do this the IMPA way? STEPHEN: A lot of the material that companies have in place now can be used and we are working on a way of transferring to the IMPA system for those that have a system in place. Also, companies will already have in place a number of standards that tick the boxes you need to tick for our system, so it won't be a case of added work or duplication - you’ll simply refer to those existing standards. What is key to understand is the fact that the UN Guiding Principles were only launched in 2011 so it’s still quite new stuff really. In fact, it’s fair to say that this project is breaking new ground in the field, which is one of the really exciting things for IMPA. The UN Guiding Principles provide the global authoritative in terms of expectations for businesses on how they should act responsibility in respecting human rights. It includes expectations of their policy commitment, due diligence processes and how they ensure remediation. The due diligence process helps businesses identify, prevent and mitigate and account for adverse human rights impacts and this encompasses managing such impacts in supplier relationships. TOM: I’m a bit lost on this human rights point. It sounds a bit scary - isn’t human rights an issue for governments around the world? STEPHEN: Yes I understand this point and it’s one I’ve been discussing with Ulla at D/S Norden who fears that talking about human rights in business will be a turn off and a difficult challenge for us to overcome. I think we have to face this head on and realise that governments, NGOs (Non-Government Organisations) and the like are looking at businesses in this way and asking them to consider their human rights impact in the same way that, over the last couple of decades or so, we’ve addressed environmental issues in our industry. 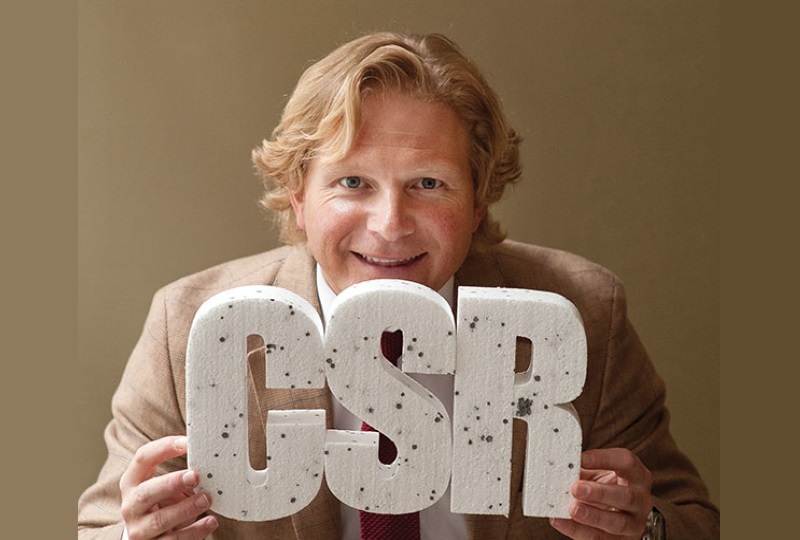 As Sune from Global CSR says, Human Rights are not only the key to social sustainability but the core - and we’ve simply got to start considering their impact as part of our business dealings. Human Rights issues for businesses are here to stay, it's an issue not going away and you’ll definitely see it more and more on the business agenda – we’re helping people with this right now and from the start. TOM: Is this the law? I mean, do companies have to do this or can they simply opt out? STEPHEN: I think there are a great many different reasons why companies need to begin looking at this, so let me explain…The UN Guiding Principles have been universally adopted and embraced by governments and businesses alike the world over, including China and Asia as well as the US and Europe. Governments are beginning to take action. The UK for example was the first to create a ministerial post in the area of CSR and Denmark’s government now insists that its top companies report onsustainability alongside their annual accounting. We are in the early days of this right now, but it’s something that’s here to stay. You might put it to one side for now but it’s coming back to you tomorrow so it just depends on your management’s thinking – do it now or later! The drivers and influencers of this include customers who will influence what shipping companies do as well as pressure from customers themselves who have the power to change behaviour. Without using specific current media examples, ask yourself which companies can survive the negative PR of adverse impacts in their supply chain? That has a significant meaning these days, doesn’t it?! Also, it’s clear that many organisations are not just seeking to achieve these minimum requirements laid out by the UN, but going beyond for their own company strategy, it provides them with a competitive advantage to show their advanced approach to responsible supply chain management as part of a wider CSR programme, increasingly this appeals to shareholders, stakeholders and investors alike. TOM: One thought here - IMPA has smaller companies as members, as well as large corporations, so is this something just for the larger companies to worry about? STEPHEN: Actually no, the UN Global Compact and Guiding Principles apply to all companies large and small, so it’s something for all entities to look at. There are even documents and guidance available for the small and medium sized enterprise (SME) and we will post links to these on the website when we launch. TOM: Will it be expensive to get involved with the IMPA system? STEPHEN: Not at all. Like many of IMPA’s projects, the cost will be modest and is likely to be based on size of company to make things fair. TOM: So what happens now? STEPHEN: Well, watch this space. We will be talking about this a great deal in the run up to IMPA London this year and the big launch will take place at the event in September with a lot planned forth. We will even have a mini conference on this at the event. Meanwhile, anyone who wants to register an interest in the project is welcome to do so by dropping me an email at the usual address. TOM: Thanks for that, I’m at least a little clearer on what’s been on your agenda and it’s clear this is going to be on IMPA’s agenda for a long time to come. I can see I’ll be reporting on this in great depth in coming months. In the next issue of the Marine Trader, Stephen Alexander, alongside members of the working group, will write in depth on the subject of responsible supply chain management, the UN Guiding Principles, Human Rights in business and the IMPA initiative on this area – make sure you get your copy!